only 7 more meals in Italy, 5 times of brushing my teeth, about 5-6 Litres of Italian water. In simpler terms: Only 2 and a half more days. The past few weeks I have had many times where I only wanted to go home. But ever since I have changed families, I have also had many more moments where I was very happy here and only today has it really caught up to me that I am leaving this family. I won’t cuddle with the kids anymore, I won’t tickle them, make them breakfast, try to convince them to do something, tell them to say „bitte“ and „danke“ (please and thank you), throw my hands up in desperation when they won’t do as I say, braid Bea’s hair, do homework with Gabriele, translate the books I’m reading to Giulio into German while I’m reading them out loud. So naturally, as I only realized today that I’m leaving all of this behind, I was not in the best of moods. Also, I can’t sleep anymore because of nerves and I’m having stomach aches. My first week back home in Vienna is already pretty full and here I’ve been struggling with finding something to do. Luckily, there was always this funky English girl by my side! As she was also today. Today we finally went to Pittarello, the three story shoe store! Without any money. Au Pairs have a very peculiar disease called ‚broke‘. In the early stages, the Au Pair moans about how little money she has, yet still ends up spending the little money she has left. In the more advanced stage, the Au Pair just can’t afford anything anymore. Erin is further advanced than me, but I’m still a victim of this disease and hope to find the cure back home in Vienna, where I make more money in less time. Though the adventure of living abroad, speaking a different language and finding new friends everyday is payment enough. At least until it ends. Well, so there we were, two broke Au Pairs in a big shoe store. It seemed very huge from outside, but to be honest, I was a little disappointed. It was smaller than it looked. On our way to the Panzerotti (Fast Food from Puglia, see Day 53), we made a detour to the public library in town. Ci abbiamo fermato We stayed quite a bit in the English book section, where I read parts of a very interesting novel about a father, who gave his newborn daughter away to the nurse, because she had downsyndrome and told everyone she had died. The title is the memory keepers‘ daughter, for those interested. Speaking of Shortbread, we actually found a fancy supermarket that sold actual Walkers Shortbread! Erin was in heaven. I was fascinated by the aquarium they had in the store. It was just that fancy!! Then we hurried home though and I did a little bit of homework with Gabriele. For English, he had to learn some basic questions like „What is your surname?“, „Where are you from?“, „Was is your favourite language?“. Yes, apparently the last one is considered a basic question. I wrote them, one underneath the other, on a piece of paper and let Gabri cut them into stripes. Then we folded the questions up and first he had to pick one and ask me, then after I had answered it was my turn. We played like this a little until Beatrice and Monica (hostmum) joined in. It was quite fun and the kids surprisingly liked it. After dinner I played with Bea and Giulio some more and I was glad to catch Bea in a good mood, since she was always quite grumpy these days. We joked around, I pretended to be an old cranky granny, which made her laugh really hard. I have to try to sleep some now. I don’t know how successful I’ll be, but I’m hoping for the best. heute schreib ich vom Computer meiner Gastfamilie aus, aus Gruenden des akuten Internetmangels. Nachdem ich heute aber was mit der Erin gemacht habe, fuehre ich den weiteren Bericht des Tages in Englisch fort, auf dass sie auch weiss (oje, nicht einmal ein scharfes S kann ich hier machen), was heute so abgegangen ist. My last Monday is gone and done and this time I managed without my weekly homesickness and grumpiness. Maybe it has to do with the fact that it is my last one here and I want to really make my last week worthwhile or maybe it has to do with the excellent company I had. You shall love me forever for my words, Erin! We had originally intended to go climb a mountain, since there are so many around and we literally would have had to only turn around with our eyes closed, stop and pick one. I still hadn’t managed to recharge my internet though, so we went into town to the TIM (Telekom Italia) store. They only said they could not help me and I had to try to work out the problem on my own. Hmmm… how I love the helpfulness of TIM here. Of course, I have not yet figured it out yet, but maybe I will until Saturday. Or maybe not. So, already being in town, we really did not feel like going back up again, but per fortuna (fortunately) I was flexible in my plans and we did what I had planned for Wednesday and went shopping for souveniers. I am too poor to buy magnets for the fridge and I figured I already had my snowglobe of Trento. Instead I chose to bring along a piece of my time here. A piece that I can share with my family and that really means something. It’s not something that comes from the heart though, it’s something that stays in the tummy! I bought Foodveniers!! The long name would be Food Souveniers, but I might as well make up a proper name for it, since I’m constantly confused with my languages anyways. 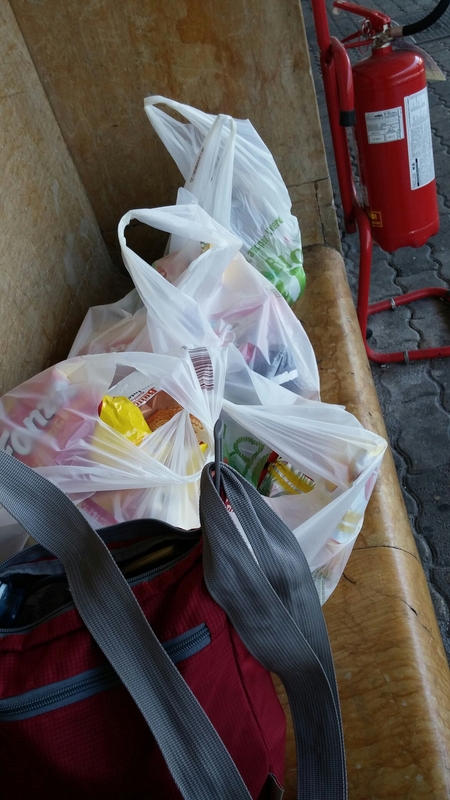 I exited the shop with 3 bags filled with snacks – I can’t even fit them all in my backpack, so I have to put them in my travel bag and travel with the huge suitcase and a travelbag! This will be a really awkward trip with so much stuff. I’m just glad I don’t travel by plane! After we had done all that, we sat in the sun in Piazza Dante, which is the park by the train station. Without all the people it would be a really nice park. All I’ll say is that a police car did a drive around twice. I know that this word does not exist, but .. did I mention my language confusion? It makes me make up my own language! Sitting peacefully with my 3 bags of food, analyzing my dreams (who knows me, knows they are sempre always very vivid) we were suddenly in the middle of a flying pigeon swarm! The pigeons here are like the men in Piazza Dante: When they fly past, they come way too close! The kids have also been told today that I’ll leave on Saturday. Gabriele asked why I can’t stay for the next two years, but then corrected himself and said next two centuries. Beatrice wasn’t in the room and Giulio, upon being asked who will bring him to kindergarten the next week, he answered: La Sofiiia! I’ll terribly miss the little kids, since they are almost like little siblings to me now. heute war mein letzter Sonntag, was bedeutet, dass ich mich von den meisten Leuten in der Kirche schon verabschieden hab müssen. Die Schwestern Miki und Monica (damit ist nicht meine Gastmutter gemeint ;)) haben mir einen wunderschönen grauen Schal als Abschiedsgeschenk gegeben. Es ist aus einem Geschäft namens Bianco aus der Stadt und am Schal dran war ein kleines Karterl vom Geschäft, wo drauf steht, dass der Schal was Besonderes ist, genauso wie der Träger und lauter so tolle Feel-Good Worte! In der Sonntagsschulklasse haben wir über diverse Gebote und die damit verbundenen Segnungen gesprochen, weil jedes Gebot hat eine gewisse Segnung zur Folge. So bekomm ich zum Beispiel durch das Zahlen des Zehntens eine gewisse Stabilität mit dem Umgang von Geld. Was mir auch sehr gut gefallen hat, war, dass mit der Heiligung des Sonntags durch in die Kirche gehen und im Großen und Ganzen Ausruhen und den Sorgen des Alltags eine Pause gönnen, Weltfrieden einhergeht. Ja, Weltfrieden. Wenn jeder sich diesen einen Tag in der Woche Zeit nehmen würde, sich seiner Segnungen bewusst zu werden und sich Zeit für Familie und Menschen, die er lieb hat nimmt, sind wir alle molto più tranquilli (viel gechillter). Zum Mittagessen bin ich zu einem Pärchen eingeladen worden. Sie ist aus Appulien (Puglia, sprich Puulja), er aus Verona. Somit hat also er ein Risotto mit ein bissl Rotkraut (radicchio, sprich: Radikkio), was typisch für die Region Veneto ist, gemacht und zur Nachspeise (nach einer kleinen Quatsch- und Verdauungspause) hat es sizilianische Granita gegeben. Granita, die man hier so kaufen kann sind leicht gecrushte Eiswürfel mit Sirup, igitt. Diese Granita haben sie mit frischen Pfirsichen, Eiswürfeln und bissi Zucker gemacht und dann ordentlich püriert, sodass es fast ein Sorbet war. Die klassischste sizilianische Granita ist mit Mandeln statt mit Obst. Mandeln hab ich jedoch getrunken! Ein typisch appulischer Mandelsirup wurde mir aufgetischt. Hmmm che bontà! Was für eine Wohltat! Dann wurden die Spielkarten ausgepackt! Erst hab ich ihnen MauMau beigebracht, dann haben wir Blödsinn gespielt, was man hierzulande Dubito (ich zweifle) nennt. Und schließlich haben wir uns noch eine Runde Kampf-UNO gegeben. Wieder zuhause angekommen hab ich eine tolle Kürbissuppe gegessen, die man am Besten mit Bröseln von Amaretto-Keksen isst, aber wir haben die Kekse im Schrank vergessen. Nach ein bissele Plaudern mit meinen Gasteltern bin ich heute ein bissele früher ins Bett, um 10 bin ich sogar schon mim Blog schreiben fertig! Obwohl, jetzt, wo ich drüber nachdenk, war ich für 5 Stunden Schlaf heut überraschend wach und gut gelaunt!! Im letzten Bus des Tages stehend, schreibe ich diese bescheidenen Zeilen über meinen letzten ganzen Samstag in Italien. Allerdings, richtig gehört, ab jetzt sind es nur noch 7 Tage! Ich hab mit dem 2 jährigen Giulio mit den Rollschuhen gespielt, was im Grunde bedeutet, dass ich ihn an den Händen haltend rumgeschoben hab. Irgendwann hat ein Stimmchen von oben meinen Namen gerufen. Jenes hat zum Alessandro (Gastvater) vom Dach aus gehört, er hat nämlich den Rauchfang geputzt. Kurzerhand haben der Kleine und ich dann eine Einladung aufs Dach bekommen, von wo aus man einen tollen Ausblick bis nach Trento hat. Per pranzo (for lunch) we had Gnocchi romanese which is a Grieß with eggs and salt (insert English translation here), which is cut into squares and then baked in the oven with Grana (parmesan) on top. Gabriele, my eldest of 9 years, has a football game every Saturday and since the sun was out and it was my last full Saturday here, we went there by feet, which took us (including stroller and dog) over an hour to get there, but I’m almost used to taking walks!! Who would have thought? We also found this really amazing sweet shop full of chocolates and other caramelle (candy). Unfortunately, it was all really expensive and we’re broke, really broke. We go revisit on Wednesday, hopefully our financial situation will be different then. We went for a quick phone recharge and a cafè d’orzo (malt coffee) at a café and then headed toward Piazza Dante to listen to a band. The small crowd was only standing there whilst Erin and me were shaking to songs like walking on sunshine and i want to break free. The band was made up of a group of young people, I might add! So we ended uo dancing in Dante!! The little spettacolo was funded by the red cross, so there were two red noses women that partied with us. They even had soap bubbles!!! Two very nice guys from the red cross, who told us never to drive drunk, since it was very very dangerous, tied our eyes with a scarf and had us sit in a car behind the weel. Seeing nothing, hearing only very distorted music and then an ignition going off, we sat in the car. We were apparently in a drunk simulation and when the car shook and we heard a crash and then only a beep and the ambulance’s horn, we thought we had died. But then the guys made us take our scarves off and we saw one of the paramedics reanimating our victim (Reanimation Annie, the practice doll). So after our grande adventure, we crossed the river (yes, we used the bridge) and found ourselves in a bar with music outside. Being still really cheery and dancy from walking on sunshine, the ACDC cover band came as a bit of a shock. But we quickly made friends with some guys that were totally loving it. Not loving it as much as the drunk guy that was dancing shirtless in the front row, but they were still big fans! I had to get the last bus to Povo, since I didn’t want to wake my hostfam by means of a barking dog – which I unfortunately did anyways – and I didn’t want to die of tiredness in church tomorrow today. heut hab ich einen neuen Meilenstein erreicht! Mein Handy hat über Nacht keinen Akku mehr gehabt und der Wecker hat so nicht geklingelt. 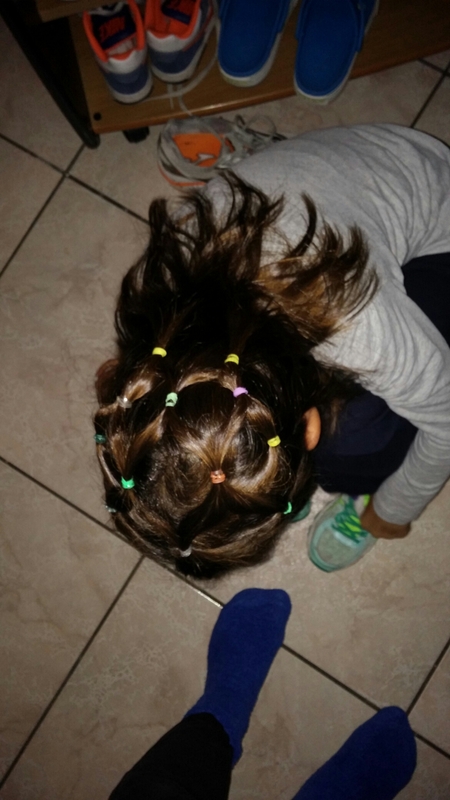 24 Minuten nach offiziellem Arbeitsbeginn bin ich dann aus meinem Zimmer gezischt, hab grad noch schnell der Bea die Haare frisiert und ihr einen Zopf gemacht, bevor die Kinder dann zum Bus gehen haben müssen. Der Giulio ist heute von alleine und glücklich aufgewacht, also haben wir Buch gelesen, wo ich aus Sprachlerngründen die Tiernamen auf Deutsch gesagt habe (Giulio Hase, Alì la piccola Biene, Schnecke Laura,…), gefrühstückt (Sachertorte von vorgestern) und dann sind auch wir schon aus dem Haus für den Kindergarten. Heute hab ich zur Abwechslung kein Tagesprogramm gehabt. Als Vormittagsbeschäftigung hab ich aufgeräumt und während ich meine Haare eine Stunde mit Lausmittel einwirken hab lassen (ich glaub, ich hab keine mehr, aber sicher ist bekanntlich sicher), hab ich mich geschminkt und ich finde, es hat nicht so schlecht ausgeschaut, auch wenns sehr dramatisch war! Es wurde trotzdem gleichzeitig mit dem Lausmittel runtergewaschen, so kann man ja nicht am Tag rumlaufen. Die älteren beiden Kinder warn heut zum Mittagessen da, sind dann aber kurz danach zum gioca ed impara (Spiel und Lern) gefahren worden, was eine Art Hort für Hausübung ist. Aber dort sind nur so 7 Kinder. Daaannn… Was war dann? Aja, dann war Zeit für einen Spaziergang/ eine Wanderung mit der Monica, ihrer Cousine und Oliver, dem Hund. Das war total nett und wir haben über das Schulsystem hier in Italien geredet. Es gibt 10 Noten. 10 ist das Beste und 6 ist genügend. Somit ist alles von 0 bis 5 nur dazu da, um den Kindern zu sagen, wie schlecht sie sind. Außerdem haben die Kinder in der Volksschule schon scienze [Schenze], was so viel wie Biologie und Physik zusammen ist. Der 9 jährige Gabri lernt in der 4. Klasse Volksschule (Quarta Elementare) von autotrophen und heterotrophen Lebewesen. Ich hab das in der 2. oder 3. Gymnasium gelernt! Mit 11 oder 12 Jahren!! Abgesehen davon lernen sie Deutsch und Englisch in der Volksschule. Und wenn die Kinder bei der HÜ Fehler machen, werden die Eltern angerufen, sie mögen doch bitte immer schaun, dass die Kinder die HÜ richtig machen. Nach unserer Rückkehr von unserer Wanderung, die diesmal kaum anstrengend war, auch, wenn ich genau dieselbe Wanderung vor einem Monat zum ersten Mal gemacht hab und ich da total außer Atem war, bin ich zur Post gegangen und hab ein paar Postkarten an meine Verwandten geschickt. Am Abend hab ich mit dem Giulio, dem Nachbarsmädel und der Alessia, der Cousine, Donner Wetter Blitz gespielt. Jenes Spiel nennt sich auf Italienisch uno due tre stella (eins zwei drei Stern), aber die Kinder lieben es zum Glück inzwischen auf Deutsch. Wir haben auch wieder das Buch Giulio Coniglio Hase gelesen. Das Deutsch greift bei den Kindern seit dieser Woche total!! Und das war es dann schon wieder. Morgen beginnen meine letzten 7 Tage hier. Es ist eine zweiseitige Münze und trotz meiner vielen Freude heim zu kommen, beginn ich die zweite Seite mehr zu sehen. Ich hab das Gefühl, der Giulio ist 5 cm gewachsen, seit ich hier bin und die Kinder sind so lieb und kuscheln immer mit mir und mit den Gasteltern hab ich am Abend immer so viele lustige und/oder interessante Gespräche… Hach..
Wann bin ich endlich wieder daheim bei meinem normalen Leben? Mit Familie. Mit Freunden. Mit Studium. Mit Sport. Es ist so cool hier. Ich sprech sicher nie wieder so gut Italienisch. (Blödsinn, wenn du wirklich Übersetzer werden willst, Sophie, wird es immer besser werden… müssen) Ich hab die Familie so gern. Was, wenn ich die alle nie wieder seh? Ich hab auf keinem Piratenschiff gearbeitet, keine Prinzen aus ihren Türmen befreit. Wo ist das große Abenteuer geblieben? Die Wahrheit ist, dass man auch wenn man mitten im Abenteuer lebt, jeden Tag für sich leben muss. Und auch, wenn ich heute Abend mega viel Spaß gehabt hab, und das für mich die Au Pair Experience war, hab ich mich nur 3 Stunden davor allein zu Tode gelangweilt. Nur 2 Stunden davor hab ich im Garten mit den Kindern gespielt und mich gefragt, wann der Tag denn endlich vorbei wäre. Also so gesehn, muss man jede Stunde, jede Minute für sich leben und das ist oft nicht allzu einfach. Vor allem, wenn man kein W-Lan hat für einen Youtube Marathon. Das ist nämlich eine der wenigen Zeiten, wo die Zeit mega schnell und sinnlos vergeht! Das hab ich natürlich sofort der Monica schreiben müssen, worauf sie „“ geantwortet hat und mich am Abend die ganze Geschichte erzählen hat lassen. Des Verbrechens des Singens bin ich eindeutig sehr schuldig! Beim Training (auch genannt Kinderwagerl-den-Berg-wieder-raufschieben) bin ich heute kaum außer Atem gekommen! Bald bin ich bereit für einen Schieben-Halbmarathon! Aufgeräumt, gesaugt, Waschbecken geputzt (die Monica hat es übrigens am Abend dankend angesprochen -> I feel good! ), geduscht, sogar geschminkt (!) und ab mit mir in die Stadt! 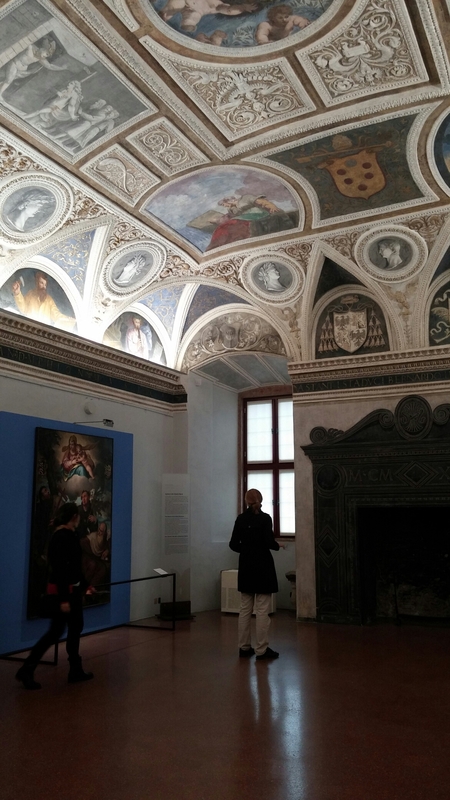 Als Truppe Kirchenmädels (2 Amerikanerinnen, eine davon eine frische Au Pair mit Jetlag und eine Italienerin aus dem Süden und ich) haben wir das Castello del Buonconsiglio (Schloss des guten Rats), was das Schloss in Trento ist, besucht. Drinnen war eine Ausstellung über Ägypten und wir haben eine mumifizierte Katze und Menschenfinger und -füße gesehen. Wir sind auch in den Turm raufgegangen und ich hab mir eine italienischen Audiotour gegeben. -und alles verstanden!! Um den Hunger zu besänftigen haben wir uns Pugliesisches Fastfood von einer Bäckerei geholt: Panzerotto (Das Wort stammt von pan wie pane – Brot, nicht von Panzer ;)). Das ist eine Art weiches Langos, zusammengefalten (=Calzone) und gefüllt mit Mozzarella und Paradeisern. Sehr gut!! Danach sind wir zur Kelli (der Amerikanerin ohne Jetlag) gegangen und haben Carcassone gespielt. Bei der Italienerin hab ich mich übrigens am Sonntag für’s Mittagessen selbst eingeladen. Yes, Aufdringlichkeit!! Für mein Abendprogramm mit den Kindern hab ich eine Weile draußen mit ihnen gespielt. Ein sehr cooles Spiel zum Sprachenlernen: La strega commanda -> die Hexe sagt, hab ich’s genannt, auch wenn es eigentlich heißt die Hexe befiehlt. Ich, die Hexe, sag: die Hexe sagt und dann sag ich eine Farbe und die Kinder müssen irgendwas in der Farbe berühren, bevor ich sie fange. Wenn ich ein Kind fange, ist es die nächste Hexe und muss was sagen. Ich hab es nach einiger Zeit so abgeändert, dass ich nicht nur Farben, sondern auch Dinge sag, wie etwa Fahrrad oder Baum. Nach dem Abendessen haben wir dann Joghurt selber gemacht, weil ich das gestern der Monica gegenüber erwähnt hab, dass das ganz leicht ist. Man kocht ein Glas Milch auf, lässt sie dann auf Zimmertemperatur abkühlen. Dann tut man einen Löffel weißes Joghurt in ein Marmeladeglas, tut die lauwarme Milch dazu und macht’s zu. Dann legt man ein heißes Hot-Cold-Pack zu seinen Socken, kuschelt das Marmeladeglas dazu und wartet bis morgen früh. Ich hoff, es ist wird nicht schlatzig. Wenn schon, lernen die Kinder halt ein neues Wort auf Deutsch! ich kann ja fast gar nicht über meinen Tag heute schreiben, bin ich doch so emotionsgeladen und begeistert über den jetzigen Moment. 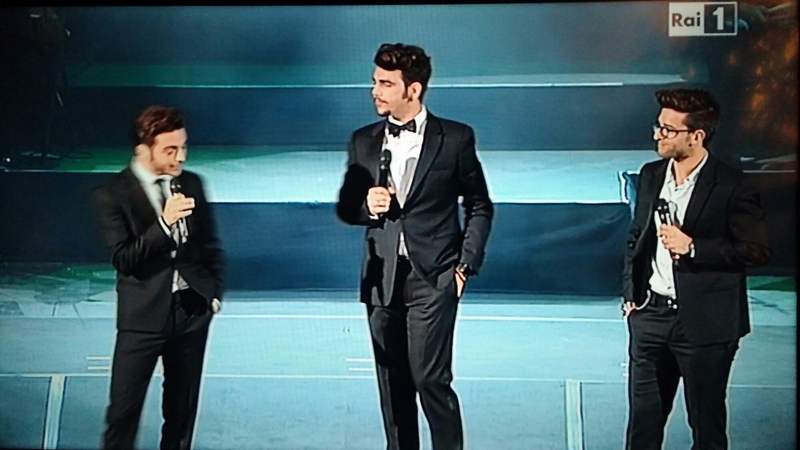 Für alle, die es nicht wissen, il Volo ist meine Lieblingsband, bestehend aus drei wunderschönen und wunderschön singenden Italienern. Und da spielt es jetzt doch tatsächlich ein Live Konzert im Fernsehen auf dem Nationalsender Rai1 (=Rai Uno). Seufz, das muss ich mir jetzt also unbedingt geben!! Okay, ich bin bereit für den restlichen Tag. Heut früh bin ich draufgekommen, dass ich jeden Montag und Dienstag total unbegeistert bin von der Arbeit, es dann aber jeden Dienstagabend voll gern hab hier zu sein. Das einzige Problem ist nur, dass ich da jede Woche neu draufkommen muss. Vielleicht merk ich es mir dann für meine letzte Woche! Heute hat es geregnet und es war eisig kalt. Oooh meine Güte, das nächste Lied, das il Volo jetzt singt ist sooo guuuut!!!!! 😀 L’immensità, ich kann es nur empfehlen! Also es war total kalt. Vorgestern war mir in der kurzen Hose heiß, heute hab ich mit 2 Westen bei 10 Grad gefroren! Im Regen hab ich das Kinderwagerl zum KiGa geschoben. Dann hab ich eine heiße Regentagdusche gebraucht. Um nicht als Eisstatuen zu enden, haben wir uns in ein Café gesetzt (was schwer zu finden war, weil die meisten Cafés hier hauptsächlich einen Außenbereich haben) und ich hab mir einen Café d’Orzo (Malzkaffee) geschnappt. 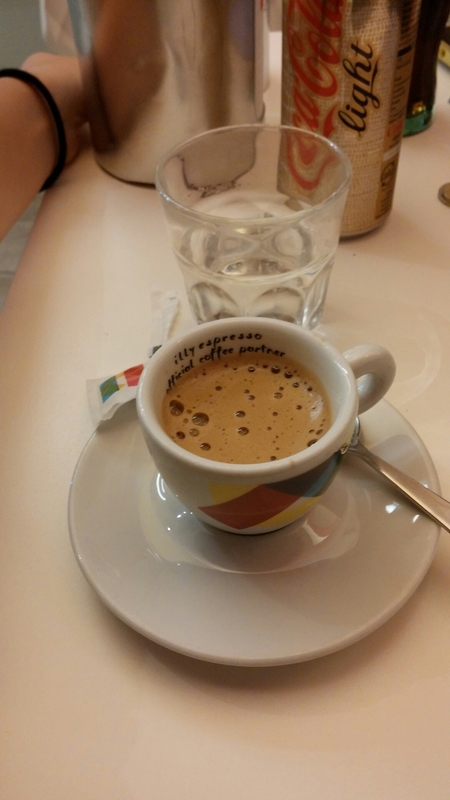 Malzkaffe hier ist nicht, wie in Ö, eine milchige Geschichte, sondern eher ein Espresso für Leute, die keinen Kaffee trinken. Aber es ist keine Horrorgeschichte, sondern eine Art Fabel!! Zur Info: seine anderen 2 Fragen sind Come ti chiami? und Tu sei una femmina? Diese Fragen stellt er mindestens 2 Mal täglich und grinst dabei immer wie ein kleines Zwetschki wie er nur grinsen kann. Daraufhin bin ich aus dem Zimmer raus und hab bissi mit ihm gespielt. Der Gabriele hat dann aber total Lust auf Torte backen gehabt, also gesagt, getan und wir haben diesmal eine Sachertorte gemacht. Wir haben nur 6 Eier, statt den erforderlichen 8 gehabt, also hab ich bissi improvisiert. Meiner Meinung nach ist sie zusammengefallen, aber die Hoffnung bleibt bestehen. Wie ich schon öfters erwähnt hab, will mir österreichische Küche hier einfach nicht gut gelingen! Ach, jetzt muss ich aber unbedingt zu meinem Abendentertainment der guten Musik und des Fangirlings zurückkehren!! hat der Tag doch angefangen, wie einer, an dem ich die Stunden gezählt hab, bis er vorbei war, war er dann am Ende doch so schön, dass ich überrascht war, dass es schon 10 am Abend war. La mattina il Giulio si è svegliato ancora un po‘ arrabbiato. Lascia mi stare, ha gridato. Ma il trucco di leggere un libro ad’alta voce vicino al piccolo funziona sempre e poco dopo era il bambino felice che conosco. Per non fare l’Olimpia con il passeggino pesante dopo di aver portato il Giulio al’asilo, ho preso un passeggino più leggere. Il problema era però che somigliava un treno vecchissimo e non può esser stato comfortevole per il Giulio! Alle nicht-Italienisch-Sprechenden haben die Geschichte vom grantigen Giulio und der Kinderwagerl-Olympia in der Früh bereits gelesen. Zumindest in abgewandelter Form. Die genaue Übersetzung muss wohl persönlich vorgetragen werden! In meiner Vormittagsfreizeit hab ich bisserl geputzt und mich dann spontan mit der Erin getroffen und wir sind in Povo rumspaziert und haben mir ein billiges Duschgel gekauft. Meines ist logischerweise eine Woche bevor ich fahre ausgegangen. Offiziell hab ich von 2 bis halb neun gearbeitet, was im Vorhinein echt lang geklungen hat, aber dann doch ganz gut funktioniert hat. Ich hab 3 Stunden lang Hausübungen mit dem Gabriele gemacht, weil alles, was schreiben ist, dauert bei ihm ewig. Beschreibe dein Lieblingserlebnis der Ferien und Tagebuch schreiben hat dementsprechend lange gedauert. Sie hat sich übrigens entschuldigt, dass sie mich letzte Woche so angegangen ist und hat gesagt, es war generell eine harte Woche für sie. Und jetzt am Abend haben wir die Familie auf Aupairworld.com angemeldet und gemeinsam einen Beschreibungstext auf Englisch geschrieben, in der Hoffnung, dass sie bald eine neue Au Pair finden. Ich mag die Familie voll, auch wenn es ein paar Sachen gibt, die ich anders machen würde, aber dafür bin ich ja nur die Au Pair und nicht die Mutter! nachdem die Familie gestern den ganzen Tag durch die Welt gelatscht ist – oder zumindest eine Ausstellung der Welt, namens EXPO Milan 2015 – hat sich die Monica heut frei genommen und die Kinder heute erst um 10 in Kindergarten und Schule gebracht. Mein Arbeitstag hat heute also um 8 mit dem Erwachen der Kinder angefangen. Die Bea will in der Früh nie wirklich was essen und heute hat es extra lange gebraucht sie dazu zu motivieren. Ich hab mir mit 2 andern Au Pairs aus Deutschland und England ausgemacht, dass wir uns um 11 in Trento treffen. Kurz bevor ich losgegangen bin, hat die Monica mir gesagt, dass die meisten Geschäfte montags erst um 3 aufmachen, was unseren Plan des Schuhe Einkaufens vernichtet hat. Naja, für mich war dieser Plan nach der Abrechnung gestern eh schon ziemlich gestorben. Stattdessen haben wir uns ein Eis geschnappt und sind durch die Stadt gegangen. Wir haben beim Beschweren über das süße Frühstück der Italiener so richtig gebondet! Ich hab die Au Pairs wirklich ur gern und hoff, dass wir nachher noch zumindest hin & wieder Kontakt halten! Um 2 hat uns leider die Erste schon für ihre Familie verlassen müssen, um 3 die Zweite. Ich bin einsam, aber fröhlich in der Stadt verblieben, denn das Free Wifi der Stadt hat endlich wieder funktioniert!! So hab ich das Internet so richtig genossen, mir eine Liederdownloadapp runtergeladen und mir endlich Lieder runtergeladen!! Nach meinem Neu-Aufsetzen des Handys vor ein paar Wochen hab ich nämlich 0 gehabt! Dann hab ich mir noch ein paar Bücher auf Amazon Kindle aufs Handy geladen und als krönenden Abschluss hab ich 5 Minuten auf Pinterest gesurft! Oh, dieses Schlaraffenland!! Nachdem mein Arbeitsplan vorgesehen hat, dass ich um 6 wieder arbeite, bin ich gegen 5 wieder raufgefahren. Sind doch normalerweise alle Türen offen, waren alle Leute heute weg und alle Türen zu. So hab ich eine Stunde im Garten gewartet, mir Feigen gepflückt, bis ich echt keine Lust mehr auf Feigen hatte und mit Skype an auf die Schaukel gesetzt. Sobald die Familie wieder da war, hab ich mit den Kindern draußen gespielt. Mit der Bea bin ich die Namen vom Gewand auf Deutsch durchgegangen und danach hab ich drinnen mim Giulio und dem Zug und den Schienen gespielt. Die Monica hat mich gebeten, die letzten 2 Wochen beim Spielen nur noch Deutsch mit den Kindern zu reden. Sie verstehen jetzt tatsächlich schon mehr und schauen auch schon schneller auf meine Gesten. Zum Abendessen hat es Couscous mit Gemüse gegeben. Niiicht schlecht als schnelles, gesundes Abendessen!